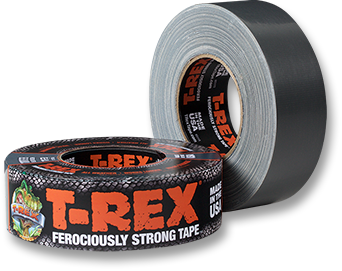 T-REX Tape is a ferociously strong 17 mil duct tape made with co-extrusion and an extreme, thickly applied adhesive. This combination gives T-REX tape 4X the holding power, 3X the staying power, and 2X the bite when compared to standard duct tapes! It really does work! YES! T-REX Tape is specially designed with a UV resistant materials which gives T-REX Tape dynamic holding power inside AND outside. We are proud to say that TREX Tape is great for the toughest jobs both indoors and out. I’m looking for a duct tape, is T-REX Tape what I want? Not only is T-REX Tape ferociously strong, but it’s also easier to work with than some other premium tapes making it perfect for big or small projects around the home, work site, inside or outside. T-REX tape will freeze below 32°F but will keep its bight when thawed. T-REX Tape is best applied above 32°F. Are there different types or sizes of T-REX Tape? T-REX Tape is its own unique ferociously designed tape and comes in 4 useful widths and lengths. Standard 1.88in x 35yd size, 1.88in x 12yd, Extra Wide 2.83in x 30yd, and the smaller but MIGHTY 1in x 10yd Mighty Roll. What type of projects should I use T-REX Tape for? T-REX Tape is the perfect tape for any project big or small. Weather it’s used for simple household fixes, or extreme industrial repairs, there’s no project to small or ferocious. T-Rex is available at major retailers, hardware stores and online retailers nationwide. Please see our where to buy section via our home page. With its ferocious construction and aggressive adhesive T-REX Tape will handle moisture better than regular tapes. Make sure you apply T-REX Tape when the surface dry to get the best waterproofing performance. And now we have NEW Waterproof Tape. How should I use T-Rex CLEAR Repair Tape in the wet? Try to remove as much water from the surface as possible. Rub the tape into the surface pushing the water out from under the tape. T-REX Tape has been the go-to tape for pro/contractors over the past 10 years. More recently this tapes rugged all-weather quality and superior performance has caught the eye of a broader base of ‘get it done once’ tape users which is why T-REX is now available nationwide. Is there an instant bond on Waterproof? On T-REX Waterproof Tape, Yes, there is an instant bond. Depending on your application and Psi, you may want to wait 24 hours after applying the tape. Does Waterproof come in White? Can Waterproof TREX be used in a dishwasher? Can you use Waterproof Tape with the pressure straight from a tap in the UK and Ireland?